I like writing about studio lighting, portrait photography and stuff like that. My Swedish blog has over 1000 blog posts, many of them about lighting techniques, behind the scenes and equipment. Unfortunately, writing the same content in English takes a lot more time, so I am trying a translation plug-in from Google. It might be confusing here and there, but I think with all the example photos and a little guesswork, you will hopefully enjoy the posts anyway. 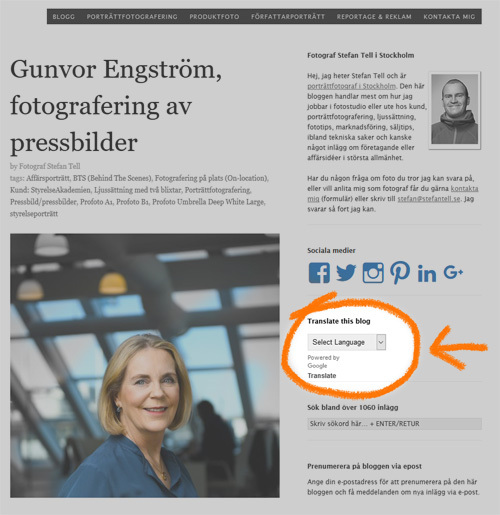 Please visit my blog about photography and lighting in Swedish, choose your language in the right column and see if you can find more interesting content.